I’m gonna put this as 5 ⭐️ because I got to meet them and they were all so nice and loving. Brynn and Eben did great as openers. Then why don’t we came out and i was so happy because so many people there and I was so happy cause they looked happy. Now the concert is over and I sad, depressed, and emo 😔 I just hope they come back soon and I can meet them again ❤️ and if you are planning on or going to a show you will not be unimpressed they are the best. We got a really good seat. The preshows and the wait was 2 hours and why don’t we lasted an hour. It was a memorable experience seeing them but I wish they interacted more with the fans on stage. 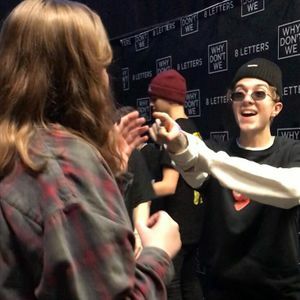 Also, at the end of the show, few fans were waiting more than 2 hours for them to come out, zach was kind enough to show up a few times then as we had to go we saw jack and took a picture with him! this concert was beyond amazing like words can’t even describe how fun this concert was. This was the most fun i’ve had in a long time. The merch was super cute and somehow I meter Ryan Herron and Myta Herron. I’m so gratefully appreciative of being able to be there. like this was so amazing. the boys looked so good, their vocals were amazing, and the environment was perfect. it felt like a party. i can’t even describe how incredible it was. It was such an amazing show!!! I probably almost fainted a few times hahaa!!! Loved the entire lineup of Brynn Elliott and Eben annnnnd, of course WHY DONT WE!!! THEY WERE ALL ABSOLUTELY AMAZING!!!! They are all amazing performers and their music is great at looking at the hardships that many of us go through with love! !Love u guys always and wont stop anytime soon! I hope/pray that one day I'll meet u guys!!! Cant wait to see where u go from here!! As always have fun and be youself! !